It is horrendously amazing how many Western NGOs, Western governments (via official government agencies) and the international bureaucratic apparatuses of the United Nations support the Islamic terrorist organizations of Hamas and the Palestine Authority (really controlled by the PLO [HERE, HERE and HERE). Hamas and the PA are nothing more Jew-Hatred organizations committed to the destruction of the Jewish Homeland and Jews in general. They are murderous cowards hoodwinking Multiculturalist power-brokers to unwittingly (or maybe even wittingly) to support the evil of murderous Jihad. Rachel Ehrenfeld exposes this money trail of Western Jihad supporters which sadly includes American taxpayers due to the sympathies of Obama’s Left Wing Administration. Since 1987, the Gaza-based terror group has kept itself in the international spotlight through acts of violence against the Jewish State of Israel. It was designated as terrorist by the Unites States in 1997. In 2006, under the guise of the “Change and Reform” party, it won the elections for the Palestinian Authority and in 2007, after violent confrontations with Fatah, took over the Gaza Strip. Since then, it has escalated its attacks against Israel. Hamas, the Muslim Brotherhood branch in Gaza, was established in December 1987, days into the Palestinian Liberation Organization’s (PLO) first Intifada against Israel. This Sunni terrorist organization controls the Gaza Strip and imposes sharia on its constituents. Unlike the Islamic State (ISIS), which flaunts its radicalism – through their brutal abuse of women and children and indiscriminate slaughter of civilians, mostly other Muslims in Iraq and Syria, mega-attacks in Europe, and a sophisticated social media apparatus, – Hamas manages to portray itself as a victim. Why? Because unlike impatient ISIS, whose agenda is to eliminate all infidels to create now the global Islamic Caliphate, Hamas, which prioritizes the destruction of the Jewish State of Israel, has been the recipient of direct and indirect support of some Muslims states, as well as supposedly Western-oriented organizations such as the European Union the United Nations, and even the United States. These are joined by international Muslim Brotherhood-affiliated and anti-Israeli groups and the international media. 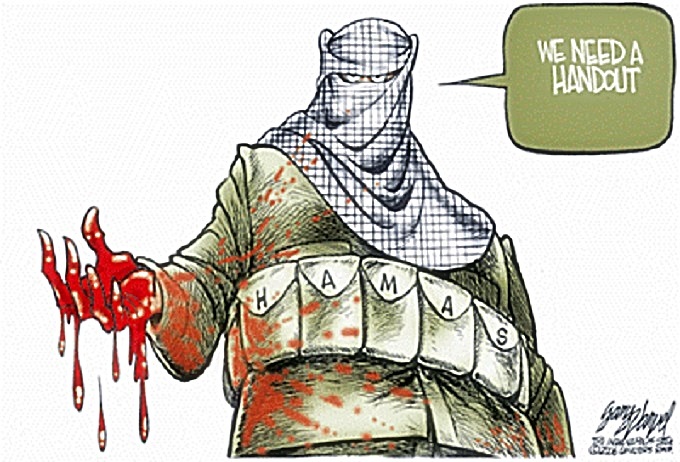 They use the guise of humanitarian aid, to assist the Hamas terrorist regime in Gaza politically and financially. The arrival of the Internet in the late 1990s introduced a new, easily-accessible vehicle for Hamas to portray the people it exploits in Gaza as victims of Israeli retaliations rather than its own twisted ideology. The terrorist organization learned that posting photos of wounded children and crying mothers has a considerable effect in the ‘hearts’ and minds’ battle in gaining the support of the international community. Thus, far from safeguarding its own citizen’s rights Hamas’ strategy has become the maximum extraction of civilian casualties from among its constituents. Last month marked the celebration of the Annual Palestine Festival for Childhood and Education in Gaza throughout the Hamas-run territory’s school system, most of which is operated and funded by the United Nations Relief and Works Agency (UNRWA). The events included young veiled girls and boys in military uniforms, simulating stabbing attacks on Israelis, killing IDF soldiers and ‘heroically’ releasing Palestinian terrorists from Israeli jails. These events were sponsored by the Ramallah-based Bank of Palestine, UK-based Interpal Fund, and the Hamas-controlled University College of Applied Sciences in Gaza, whose funders include the World Bank and European Commission. While many in the free world would find this link between international aid and a celebration of hatred alarming, it is the norm rather than the exception in the Hamas-ruled coastal enclave, where democratic principals [sic] are quashed and wanton hatred of Israel propagated. Estimates of how much money flows into Hamastan are varied. However, as events such as the Annual Palestine Festival for Childhood and Education, and the continuing tunnel- construction rather than rebuilding Gaza’s shattered infrastructure shows, much of the funding that goes to Gaza directly and through the PA, aid Hamas’s terrorist agenda against Israel, rather than improving the lives of Gazans. The ACD is dedicated to exposing threats to our free speech rights, political and economic freedoms and national security. ACD is a 501(c)(3) not-for-profit organization. All contributions are tax-deductible to the fullest extent of the law. ACD fills an important gap created by inadequate risk assessments of our cyberspace, GPS & UTC. We use our Threatcon programs, our multidimensional Terrorist Finance Network Tracker (TFNT), and our experts to better inform government, public and private sectors’ policy makers. ACD’s synergistic approach to connect the dots on emerging threats is facilitated by extensive multidisciplinary global research in various languages. We publish our knowledge-based analysis and use the information to offer special tools to help prevent and mitigate such threats. ACD’s Threatcon, offers individually tailored programs of briefing and scenario gaming to encourage government, public and private sectors to cooperate in preventing and mitigating the risks to our political and economic freedoms and to our national security. ACD’s Terrorist Finance Network Tracker (TFNT), a unique anti money laundering (AML) system, is using a multidimensional approach to build and regularly update a comprehensive database identifying operational and financial networks of transnational radical Islamic groups.